Wildlife gardening is all about working with the balance of nature. The idea is to enhance your garden to attract a range of wildlife including birds, insects, frogs, hedgehogs, butterflies, native wildflowers, plants and trees. In essence, wildlife gardening involves working with nature to create a space for our native wildlife that is finding much of our landscape less and less suitable for survival. How do I make a Wildlife Garden? Wildlife gardening actually requires the minimum amount of maintenance, so once you have it established you will have more time to sit back and enjoy the wildlife that benefits from your efforts. One of the key things to remember is that in nature, everything is in balance and so there is no such thing as a ‘pest’. All insects (and other animals and plants) have natural predators and diseases that prevent them from going out of control, or becoming what we call ‘pests’. In your wildlife garden, aim to attract as many different types of native flowers and trees, insects and birds, and then you can sit back and relax, while nature takes care of itself! Ivy is surprisingly helpful in attracting a range of wildlife. 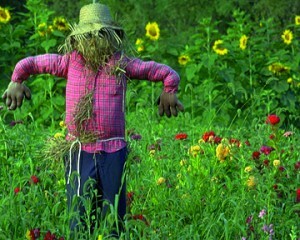 Encourage it to produce flowering stems by pulling the shoots away from their support so that they hang free. The flowers will attract butterflies such as peacock and toirtoiseshell, which feed on their nectar. They may also hibernate in the ivy over the winter. The flowers will produce berries whcih are a good food supply in the winter for birds. You may also notice birds such as dunnocks, chaffinches and blackbirds nesting amongst the intertwining stems. Encourage birds to your garden by feeding them in winter and providing undisturbed places for them to nest from autumn onwards. 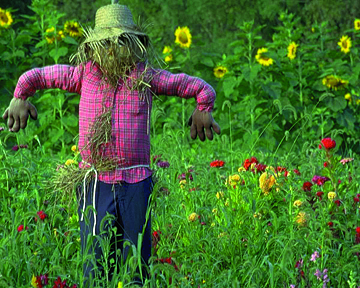 Don’t use chemical pesticides. These can pollute our watercourses and harm wildlife. Nature has its own pest controllers, so if you can attract them to your garden, you won’t need to use chemicals. For instance, ladybirds, hoverflies and lacewings feed on greenfly and aphids while frogs and hedgehogs feast on slugs. 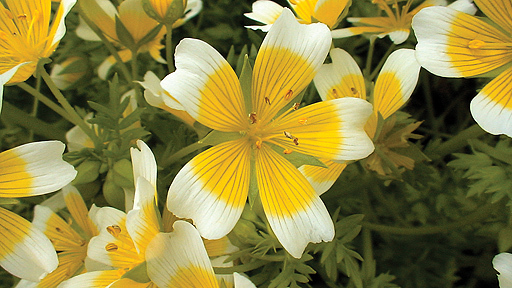 You can attract hoverflies by planting the poached egg plant amongst your vegetables or flowerbeds. A hoverfly can eat a thousand greenfly in its short lifetime! 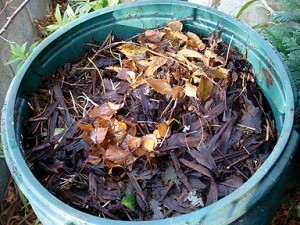 Start a compost heap or cone. This is not only a great way to recycle the nutrients in your garden but it also provides a frost-free area in winter where birds can find insects and seeds. The compost heap itself acts as a mini-wildlife refuge with numerous insects, bacteria and fungi making their home inside and speeding up the decomposition process. It may also provide a hibernation spot in winter for frogs and hedgehogs. Don’t use chemical fertilizers. For one thing they don’t encourage strong plant growth or healthy root development and secondly they can get washed into our watercourses and upset the chemical balance there. Instead, use your home-made compost plus homemade liquid feeds from nettles, comfrey or farmyard manure. You can also buy peat-free composts – see our list of peat free suppliers. A water feature in your garden will introduce aquatic creatures and plants and attract many passing wildlife visitors to drink and bathe in the water. The larger the pond, the greater the diversity of wildlife living in it will be. 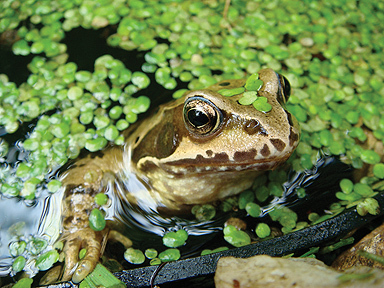 If you want to attract frogs, ensure that the edge of the pond is shallow to allow the froglets to exit and don’t add fish as they will eat frog spawn. Plant a good cover of vegetation at the border of the pond to provide cover for shy wildlife. 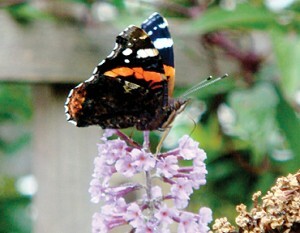 Make butterflies welcome in your garden. Peacock, red admiral and tortoiseshell caterpillars are perfectly happy with a good crop of young nettles on which to feed. Cut some of the nettles back regularly to encourage fresh growth. Offer adult butterflies nectar from Buddleia (otherwise known as the ‘butterfly bush’), lilac, knapweed and honeysuckle. Herbs such as sage, thyme and mint are not only tasty in cooking but they also attract bees. Plant marjoram or lavender for lots of bees. Grow native plants and trees for wildlife food. Thistles, teasel, hawthorn, ivy and mountain ash are just some of our native plants that provide seeds for wildilfe. Leave a small pile of stones or sticks and logs in a corner as a home for hedgehogs and groundbeetles. The dead wood is also a great habitat for insects and unusual fungi. Diversity is the Key: The more diverse your garden is in terms of different plants and features and habitats then the more likely you are to attract a great variety of wildlife.